*there are minor spoilers here. Writers: Scott Michael Campbell and Hunter G. Williams. Cast: Chris Hayes, Jeff Stearns, Becka Adams, Angelina Lyubomirova, Callie Cameron, Kelsi Cullimore, Andrew Olson and Brooke Johnson. The Whispering Dead is a paranormal piece that deals with a haunted hospital in Northern California. 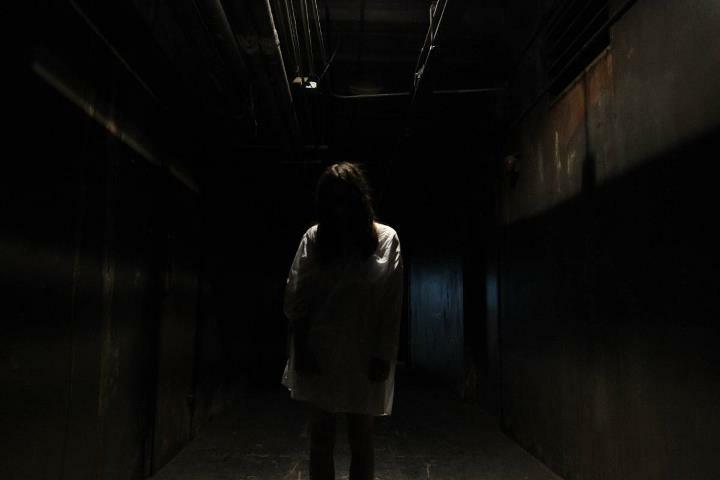 The Whispering Dead will be the first film to be released by production house Busted Knuckle Productions and the film offers an enjoyable ghostly time. The acting from the small cast is well done. As well, the hauntings are all filmed expertly with the help of infrared cameras. Although there is no music throughout, The Whispering Dead is a compelling supernatural thriller. The film begins in Los Angeles. Six filmmakers are getting set to investigate rumours of burnings, cannibalism, suicide and murder at the nearby Edinburgh Hospital. They head up to the location, while talking about some of the building's past tragedies. The character Chris Mitchel (Chris Hayes) seems to delight in terrifying his co-workers with tales of disappearances and violence. The other crew members are slightly jarred. But, the real thrills come when all six break into the hospital. Now, the ghosts are released and the characters are tasked with finding a way out. The spirits have other plans for them, however. Some of the cast members and characters are a little more interesting than others. The film seems to focus on the characters: Chris, Jeff (Jeff Stearns) and Becka. Becka is the producer of the new reality show and actress Becka Adams is able to deliver the stress of deadlines, production delays and the difficulty in creating a paranormal experience for television. This character also delivers some of the best snarky lines as Becka chastises her female co-workers. Becka is a fun character to follow, until a spirit comes knocking. Actor Chris Hayes also delivers a compelling performance. His character, Chris, is the frontman for the series and he keeps the film moving forward. He is often ushering the other characters from room to room, while also creating some of the paranormal gags. Chris holds and impromptu seance, which is helped by some off camera trickery. His gags are no longer needed when three ghostly young girls flow in and out of scenes. Hayes' performance is well researched and his acting skills deliver some of the much needed energy in the film. Director Hunter G. Williams also captures all of the supernatural elements effectively. The film relies on a number of handheld shots. The characters provide much of the footage as they film darkened halls and rooms. However, there are several infrared cameras, which shoot the action from overhead. Much of the film takes place at night, so these cameras are necessary. These cameras also add a creepy vibe. Shapes seem to move in and out of the backgrounds, some are real and others are imagined. Williams also captures many of the action shots believably. Characters fly down corridors with the camera partially following them. The visual sphere is consistently well shot. This critic, of course, has a few minor complaints. 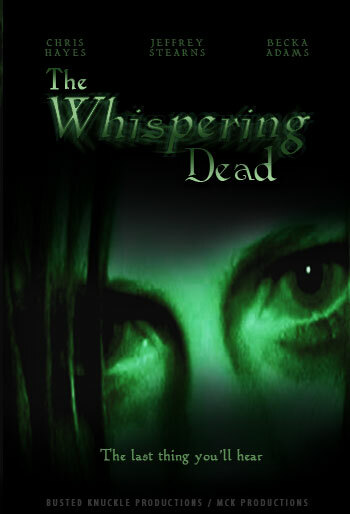 The Whispering Dead does not utilize music, except in early scenes. Music is often able to amplify tension, but it is absent here. The producers likely decided to remove any instances of a soundtrack in order to focus on the realism of the action on screen and amongst characters. As well, a supernatural element is introduced early with the character Elizabeth. But, her history is only partially developed. A story can often increase its depth by delivering a thought provoking or well fleshed out antagonist. And, this reviewer wanted to know about Elizabeth's other-worldly powers. These minor critiques might not apply to other viewers and their opinions of the film, though. The Whispering Dead is nearing a distribution date as Hunter G. Williams and other members of Busted Knuckle Productions finalize a release date. 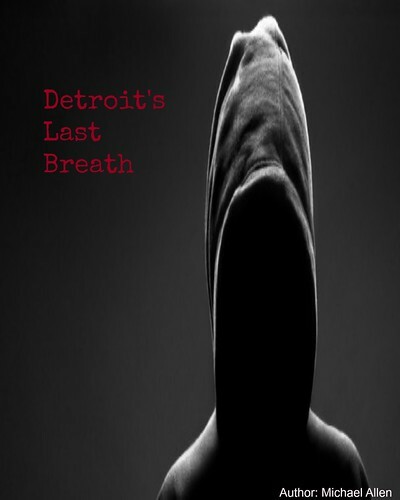 Fans of the paranormal will find a few scares in the productions. Also, the well written dialogue creates for some laughter as each crew member does their best to scare others in the production. Well acted and effectively shot, The Whispering Dead is a fun film that increases its creepy vibe with some non-traditional camera work. Overall: 7.5 out of 10 (the protagonists are given lots of time to develop, a good setting, a solid script and great dialogue, the backstories of the hospital are one of the film's best elements).